Ousted Prime Minister Nawaz Sharif thumbs his nose at the Pakistani judiciary and is all set to regain the chairmanship of his party. One would be hard put to come up with many instances of open and provocatively brazen defiance of justice of the type currently being honed by Pakistan’s disgraced former PM Nawaz Sharif. As these lines are being written, Sharif is being driven on the highway leading to Islamabad from its airport in a convoy of 28 limousines and security escorts. It’s reminiscent of a Moghul king royally riding into his capital in a show of regal pomp and glory. This obscene spectacle of a leader dethroned from his pedestal of power by the country’s apex court, less than two months ago, for corruption has a message writ invisibly large on it: Nawaz cares two hoots for the Supreme Court of Pakistan and is out to defy its ruling with as much contempt as he and his minions can muster. Not that Nawaz is a novice, by any stretch, at defying the call of justice. He has a history of confrontation with the country’s apex court going back to more than two decades. In 1997, when his election malpractices were under the top court’s focus he had unleashed his party goons at the court. In an act of lunacy, the Supreme Court building was cordoned off by his armed goons who invaded the premises like vandals. The justices of the court had to run for cover to save their lives. In the latest instance too, defiance has been the name of Nawaz’s game against the court from the moment he was found guilty of corrupt practices to amass unprecedented fortunes for his family and children. Flexing his muscles the day after, in a show of raw strength, he embarked on a land journey from Islamabad to Lahore; his minions and cohorts made sure there were frenzied crowds all along the convoy’s route hailing him as their ‘hero’. 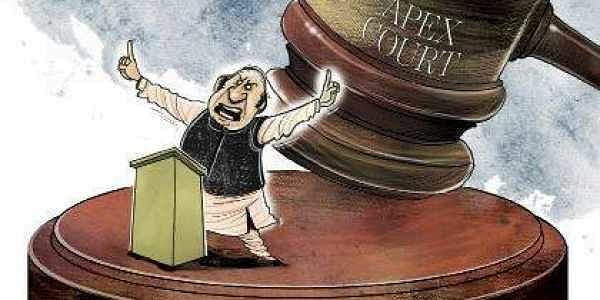 Nawaz’s theatrics were all designed to paint him as an innocent ‘victim’ of the court’s ire against him and his family. Then, he thumbed his nose at the court again in nominating his ailing wife, Kulsoom, suffering from cancer and undergoing treatment in London, to fill the parliamentary seat vacated by him. The sympathy vote for Kulsoom, in the September 17 by-election won her the disgraced Nawaz’s parliamentary seat quite comfortably. Ironically, her rival from Imran Khan’s party happened to be a lady medical doctor who has been a ‘Mother Teresa’ to the people of that very same constituency. But politics in Pakistan follows its own mind-boggling chemistry and must never be judged by conventional wisdom. The by-election result galvanised Nawaz’s campaign of saying ‘pox on your house’ to the court in an instance of unprecedented insult to the whole superstructure of justice in Pakistan. The defiant campaign just went into overdrive. Nawaz had taken off for the more salubrious London climes but his acolytes set about to garnish his relaunching ‘movement’ with a legislative dressing. The Pakistan constitution had a clear, categorical provision disqualifying a disgraced politician from leading a political party. The rule was simple: anyone not qualified to sit in the parliament couldn’t lead a political party from outside of it. Nawaz had become a pariah to be the leader of his Muslim League. But then his party’s numerical strength in the lower house of the parliament kicked in. By a simple majority, the proviso blocking Nawaz’s path to leadership was removed while Nawaz was still attending to his ailing wife in London. But the next phase in the upper house, the Senate, was tougher. Nawaz didn’t have the numbers in his favour; the opposition had the upper hand there and Nawaz’ nemesis, Imran Khan, was sworn to rally support against the move to rehabilitate his disgraced quarry. Once again, however, the alchemy of Pakistan’s feudal political culture performed the miracle of turning obvious defeat into a stunning victory. Nawaz has coffers bulging with money; the government in power is still of his party that can dole out favours aplenty. The combination of these two ingredients whipped up enough potency to defeat Imran Khan’s carefully calibrated effort to block Nawaz. The Senate on Friday passed the Electoral Reforms Bill 2017 which would pave the way for Nawaz Sharif to regain chairmanship of his party. The vote—38 for and 37 against—smoothed Nawaz’s passage to retain power as his party’s kingmaker. Little did Imran realise that there were Quislings in his own ranks; some of his party senators conveniently slipped out of the house before the count was taken. So, Nawaz’s triumphant return home on the heels of the Senate vote makes all the sense for him. He has bounced back to the centre of power in Pakistan’s arcane politics in less than two months of the apex court showing him the door. He retains his position of calling the shots from outside the parliament, pulling the strings of the puppets ruling in his name. The reloading of all the bases in Nawaz’s favour is prompting pundits to pronounce ill tidings for next year’s impending general elections. Most agree that in the new scenario not much change may be expected in the political calculus. One shouldn’t be surprised if Nawaz’s party retains power at the centre under the banner of a disgraced leader who can’t be a member of the parliament. While all this may be manna to Nawaz and the corrupt house he presides over, it bodes ill for the country already deeply divided in more senses than one. With bruising fissures all over its façade and the nation’s harmony and equanimity haemorrhaging, the need for wound-binding couldn’t be greater. But that may be asking for the moon in the current scenario.